Black and white negative of a photograph of the 1943-1944 All Ontario Juvenile Champions. Back row: Vernon Rowe (executive), Ed Bowman (executive), Jim Heffering (sponsor), Pat McCloskey, Ross Lowe, Fred Harden, Tod Lintner, Lloyd Pascoe, Hank Valentine, Bill Cook, Police Chief Bill Elliott (executive), Gord Hawes (manager), Brian Burkhart, Jim Sleightholm. Front row: Bill Lowe, Les Moore, Lawrence Heffering, Bill Dilling, Wally Samanski, Jim Corner, Wilmot Gates. 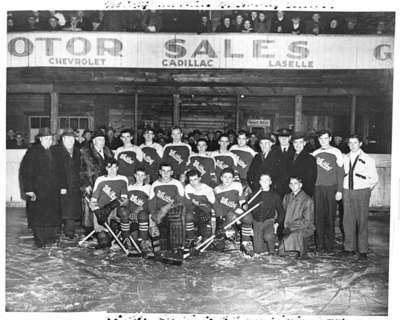 Photograph was taken at the Taylor Arena which was located on the east side of Brock Street between Gilbert and Ontario Streets. Portion of writing across the bottom of the photograph is illegible. Whitby All Ontario Juvenile "B" Champion Hockey Team, March 1944, Photographer Unknown. Whitby Archives 21-005-012.